You are here: Home / Finished Projects / Colette Ceylon… Finally. It’s taken me nearly ten weeks. Yes, that is a while. I have had disasters with my home sewing machine (which I now hate, hate, hate!!) and I did have a few weeks off in between as well. But it is done, now, thankfully! 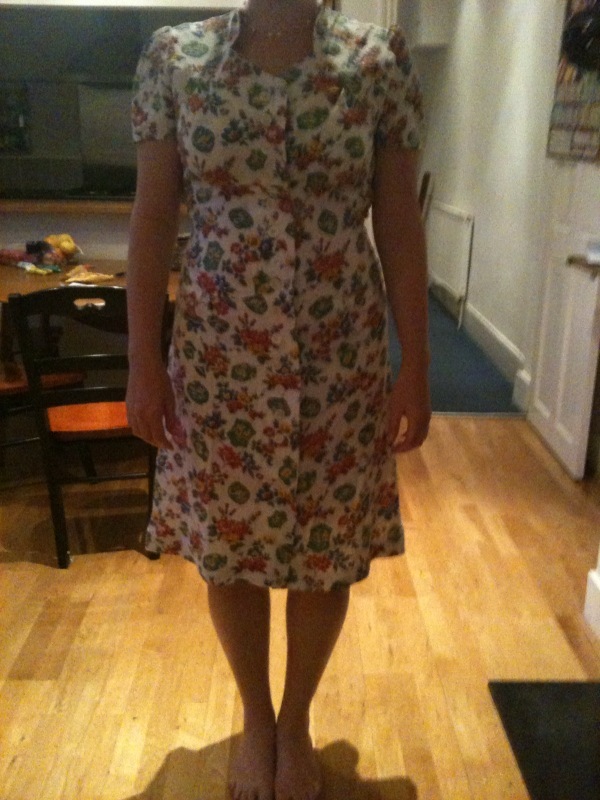 Close fitting, shirt dress with inset waist, slightly dropped and curved waistline and neckline yoke. Multisized 0-18. I cut the 14 but suspect I should probably have cut out the 12. Did it look like the Pattern Envelope? 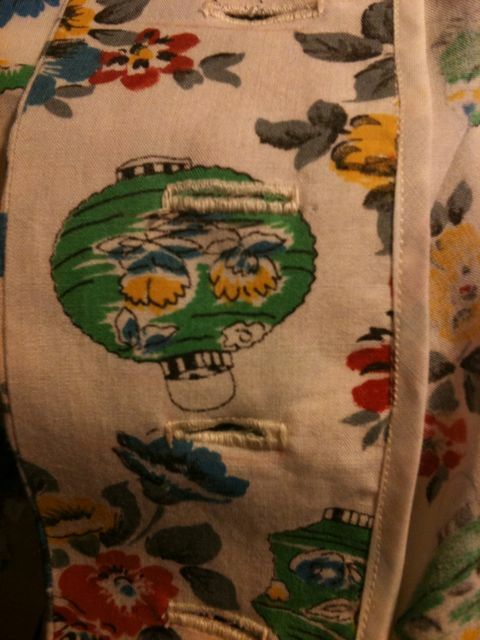 V intage 1940’s fabric I bought off Ebay about a year ago, cotton mix? All of Colette patterns come in a handy instruction booklet and they are a dream to follow! Thankfully because I was short on fabric I had to cut quite a bit off on the sides of the dress, there was far too much volume/width for my liking – but that’s personal preference and I’m not particularly ‘hippy’. 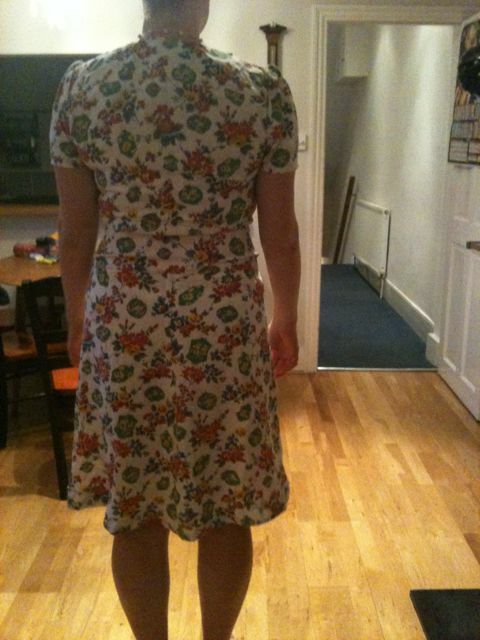 I took it up quite a bit at the hem so that the dress was knee length/just above knee length. I added about 1.5cm to the bodice front and took off the same from the midriff front to adjust for my chest, then did the same for the yoke back and midriff back so the seams would all match. The fabric that I chose was quite a thin cotton blend and tended to stretch and slip quite easily. 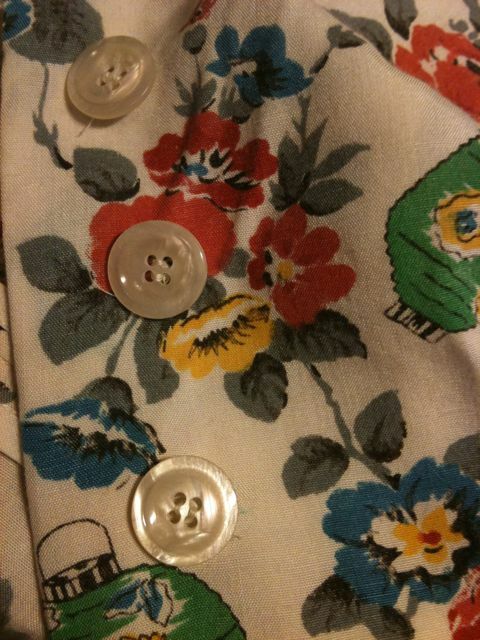 My Buttonholes – probably not the neatest but the way my machine has been behaving, a miracle that it got done! !